Is improving classroom management one of your resolutions for 2019? This resource will help you meet that goal! DO YOU WANT TO BE AN EFFECTIVE TEACHER? As you get ready to go back to school, strong classroom management skills are the key to success in the classroom. READ THE WONDERFUL REVIEWS FROM TEACHERS USE THIS. 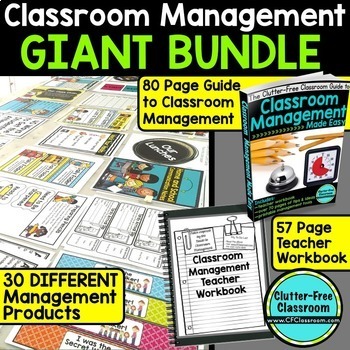 This BUNDLE includes the tools to make you a more productive, efficient teacher which will increase student learning and decrease your stress level. As a classroom teacher you are under constant scrutiny by administrators, parents, and the general public. How you manage your classroom impacts not only your students' academic growth and happiness, but also your teacher evaluations and in many cases your pay and job security. A poorly managed classroom results in avoidable behavior problems, decreased motivation, general feelings of stress and uneasiness and lost time on task. Investing the time to sharpen your classroom management skills, implement strategies and tools to streamline management tasks and developing routines and strategies to ensure your classroom "runs itself" will be greatly rewarded in countless ways. 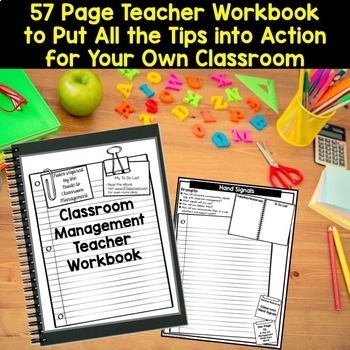 Includes 80 Pages of Tips and Ideas based on tried and true methods that have been used by real teachers in real classrooms. This 57 page workbook is a companion guide to the eBook. 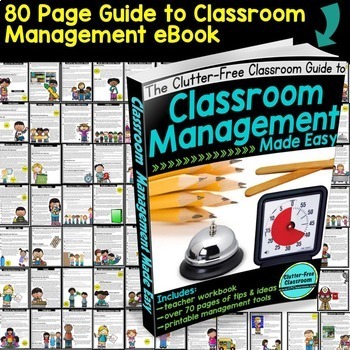 It was designed to allow you to take notes and organize your own thoughts and ideas on how you will address each management task in your own classroom. With easy-to-use references to the eBook and prompts to get you thinking, you will be sure to find this to be a valuable tool. THERE ARE ALSO 30 INDIVIDUAL PRODUCTS INCLUDED IN THE BUNDLE! ☺ L said..."This is amazing...thank you SO much for putting these all together in an affordable package!" ☺ John G said...“There were so many things in here that had never crossed my mind to consider. After 8 years of teaching 3rd grade I was left smacking my head and saying, 'Why didn't I ever do THAT before” over and over. I'm definitely bringing my A game to the classroom as a result of your hard work. Much appreciated."